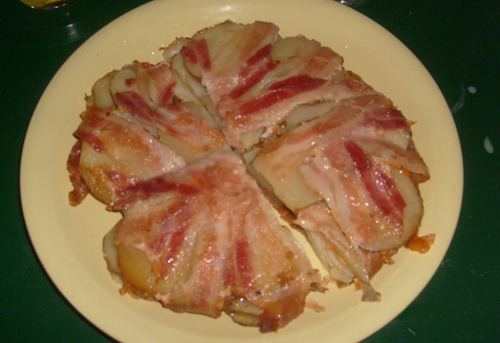 Layers of scalloped potatoes and cheese wrapped in bacon. Hi Calpernia! I wonder if you remember me? I am a friend of Kimber Menjivar, have met you many time, been out with you. I now write a healthy comfort food and healthy baking column for Examiner.com. I would adore you even more, if you could link to my main page! Goddess Kimber dubbed me Diva if that helps you remember who I am, red head, my pic is on my site! I do hope you email me, I'd love to catch up. My nephew, Steven Talbott and I were just talking about you the other day and then I ran across this blog, fate, girl! Toodles, Linda.